We often mumble, curse, use slang words, and say anything that comes to mind, but Allah and His Messenger continuously gave words their needed reverence. The Quran starts with the command to read (iqra'). Allah could have revealed the teachings of Islam directly to our minds, but instead, He chose to present these teachings in the form of speech and written word. 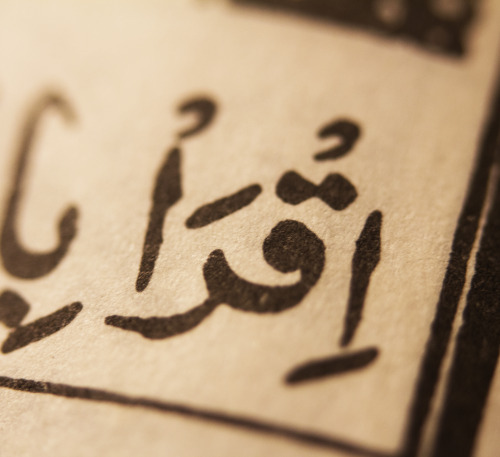 Allah brought about the creation with the word "be!" When Allah created Adam, He taught him all of the names (2:31), and Adam thereafter taught the names to the angels. Allah distinguishes humans with their ability to articulate their thoughts and feelings (55:3-4). While some animals share some characteristics with humans, nothing can be compared to the complexity of human speech. When Moses became a prophet, he first prayed for the ability to speak clearly (20:25-28), and Allah granted that to him so that he may succeed in his mission. Allah's favour on Moses was that He spoke directly to him. Lady Mary vowed to fast from words (19:26), yet we feel comfortable running our mouths all the time. The Messenger of Allah (s) said that he had been commissioned with "succinct language" (جوامع الكلم); expressions that are comprehensive yet condensed, designed to deliver full meanings with few words. As a Prophet with a weighty assignment, he made sure that his words were unambiguous and direct, yet eloquent and nuanced at the same time. Imam `Ali [a] said to his scribe, "Put cotton flake in the inkpot, keep the nib of your pen long, leave space between lines, and close up the letters, because this is good for the beauty of the writing." 315. وَ قَالَ عليه السلامة لِكَاتِبِهِ عُبَيْدِ اللَّهِ بْنِ أَبِى رَافِعٍ: أَلِقْ دَوَاتَكَ وَ أَطِلْ جِلْفَةَ قَلَمِكَ وَ فَرِّجْ بَيْنَ السُّطُورِ وَ قَرْمِطْ بَيْنَ الْحُرُوفِ فَإِنَّ ذَلِكَ أَجْدَرُ بِصَبَاحَةِ الْخَطِّ . Words constitute the shahada, words constitute salat, and words constitute du`a'. Keep the tasbeehat and salawat on your tongue. Give each vowel, letter, word, and sentence its haq. Your mouth is like a womb that gives birth to meaning, so take care of your offspring, because they will represent you in your absence. It's important to not just relegate religion to an abstract group of theological concepts. The focus of my work is to find the cosmic, then translate it into ethics, and then translate that into the practical. This is based on the Prophetic hadith, "Surely, knowledge is three: a firm sign, a just obligation, and an established Sunna." Regarding my previous post: in my classroom, "respect words" is rule #1, written on chart paper. In addition to speaking the truth, maintaining your promises and thinking before you speak, I tell students that "respect words" means to not interrupt one another -- this would be equivalent to two different symphonies occurring at once. I tell them to write their poetry in cursive with a nice pen, and not just any ballpoint pen. Allah made His creation beautiful, and He made it a sign of Him; so we should strive to make our words and writings beautiful as well. Sometimes the kids need reminders, but they get it and they like it.